Its been quite a while I blogged. However during this big pause I learnt one thing about myself. I don’t publish unless I’m convinced information which I’m posting is not found or neatly explained. I have been always confused on persistent desktops, stateful desktops, stateless desktops, Full cloned, linked clone. I have only heard of linked clone, other terms are interchangeably used. This is post is aimed at clarifying these doubts. Pools are basically collections of desktops. These desktop are either pre-created or can be created on the fly or can be created as demand increases. Pool is like a group policy. If you define it once and it applies to group of users and computers. Similarly in pools you can defined various settings to control deployment of desktops, logoff action, provisioning style sysprep/quickprep. Desktops are automatically created. You can specify total number of virtual machines you wish pool to provision at any given time. With automatic pool you also have option to keep minimum number of VM to Spare for new users. This will allow you to control how frequently VMs should be provisioned, there by controlling load on the view composer/vCenter servers. Setting also ensures desktops are available for immediate use. Please note horizon view licenses are based on current users. Once you know the number of concurrent users, you can designed this parameter accordingly. If you are purchasing 1000 concurrent user licenses, then you should never put more than 1000 as maximum number of VM per pool. Manual is used when Desktop VM is already provisioned and available in vcenter. Or it is not managed by vCenter (e.g. Hyper-V, SCVMM) or it is physical desktop. Very limited use case. It is terminal service now renamed by Microsoft as Remote Desktop Services (RDS).Primarily used to publish session based desktops and applications. However in RDSH pool, You can only create a session based desktops for users. Remember this is not pool of desktops. User can log into RDSH simultaneously. RDSH based desktop pools only supports Windows Based desktops. Again, very limited use case for desktops. In fact RDSH real power is to publish applications on RDSH servers and make it accessible from any device. Simplest way to select the type of pool is to find if you are using only view based VMs? If yes, answer is automated pool. Are you going to use some 3rd party desktop management software and User profile management software? If answer is Yes, think of RDSH based pool. e.g. MS Office, Windows OS license and other software products which support CAL types. #  RDSH you don’t have floating desktops or dedicated desktop pools. What else users work profile would be? It is major driving factor to choose Automated over RDSH Pool. 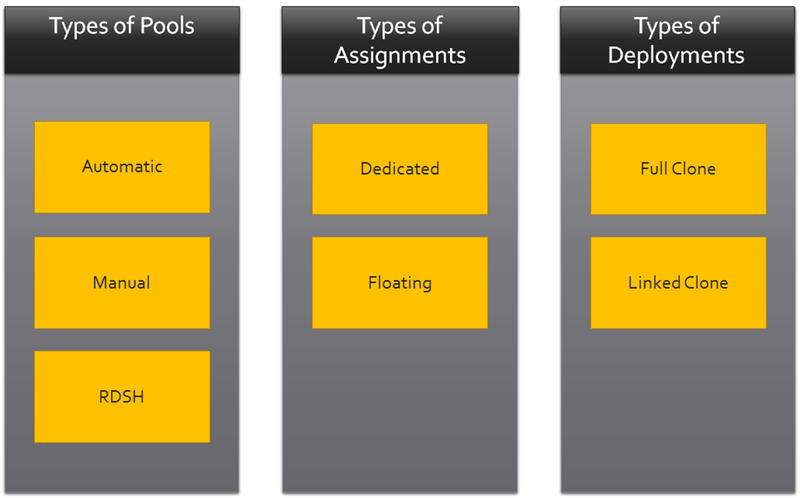 In next post we discuss Types of Assignments and Types of Deployments how they further impact the pool selection type. 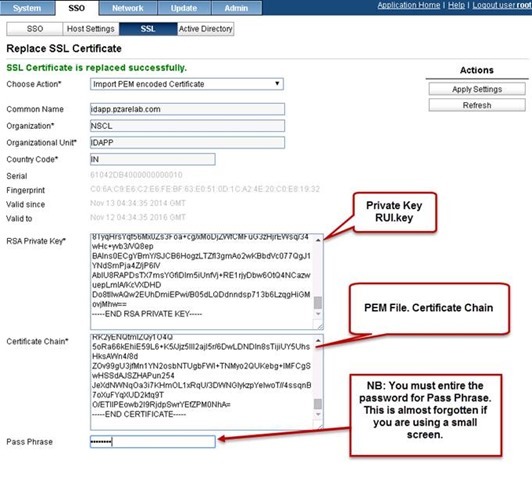 After certificate steps are followed, Insert the private key which is rui.key in to RSA Private Key and insert RUI.PEM which is certificate chain. NB: You must entire the password for Pass Phrase. This is almost forgotten if you are using a small screen. 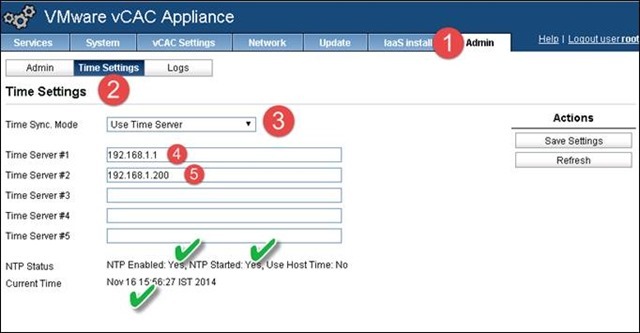 Deploy vCAC Appliance and Power On the appliance. I’m not including vCenter SSO and Postgres SQL database installation and configuration procedure, as they have been very well document. Reservation policy is often unused feature and to some extend not fully understood. Primary reason could be that reservation policy creation process very simple and during policy creation we don’t glue pieces together. That being said there are very valid use cases for using reservation policy and comes very handy in VM Placement. One of the core principles of Software Defined Datacenter (SDDC) suggests we need to have policy based automation and common management platform across the entire infrastructure. With reservation policy we address this requirement. It is my personal belief that features in any products are aimed to solve some or other business problems. All we should attempt is to find those relevant business case or help someone find them. In this blog I aim for later. After going through the FAQ post, I thought it is easier to construct a flow chart based on my understanding. 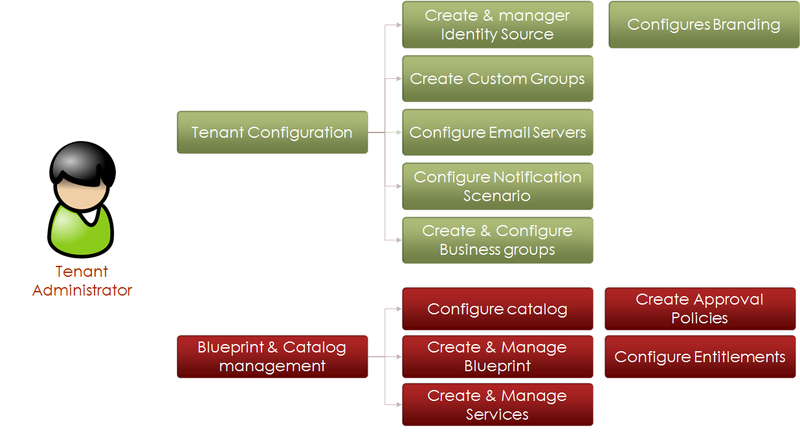 I’m happy I can cover most of the tenant configurations using below flow chart. 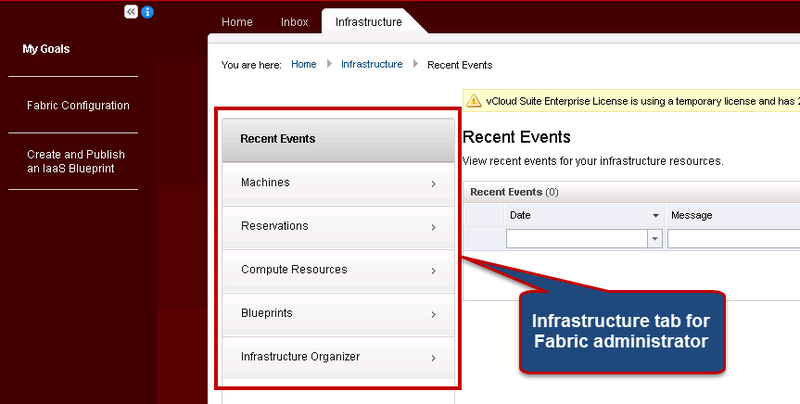 Second: Infrastructure Administrator creates fabric. In simple words he maps ESXi cluster/s inside vCAC. 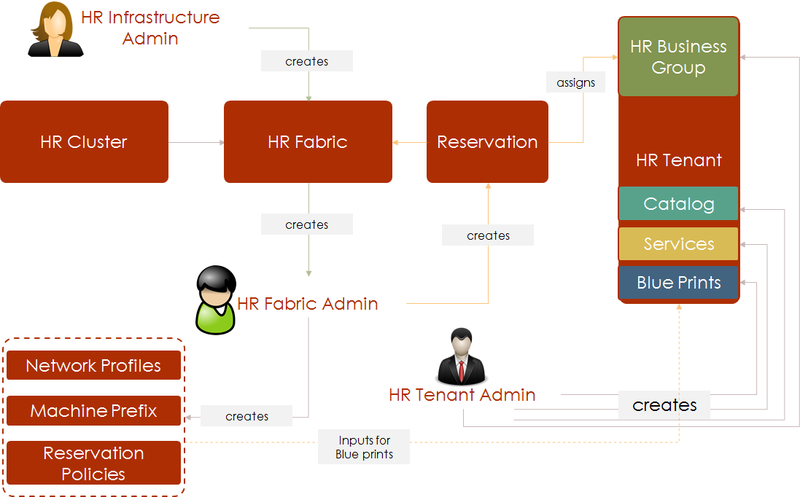 On left hand side, I have a cluster dedicated for HR Business Unit (HRBU) by name HR Cluster. 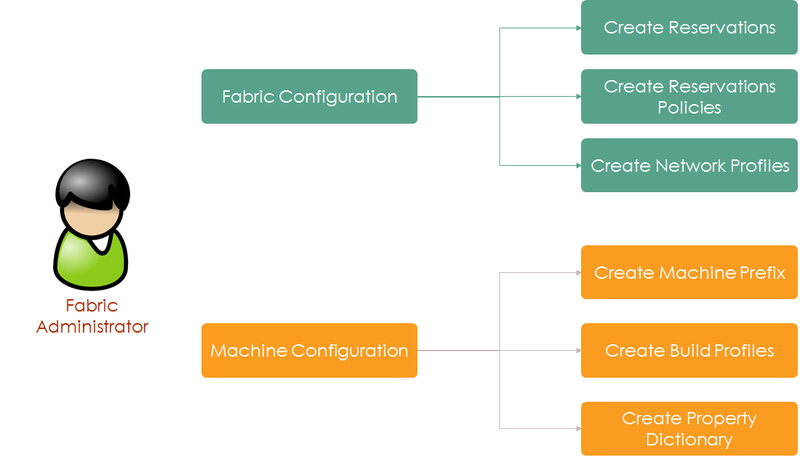 While creating fabric you must create fabric administrator. Fourth: Tenant Administrator creates business group but unless machine prefix is created business group cannot be created. NB: There is option for Tenant administrator to create machine prefix. Tenant administrator then creates Blueprints. He publishes blueprints. Published blueprint is referred as catalog item. He creates service and assign catalog item to service. 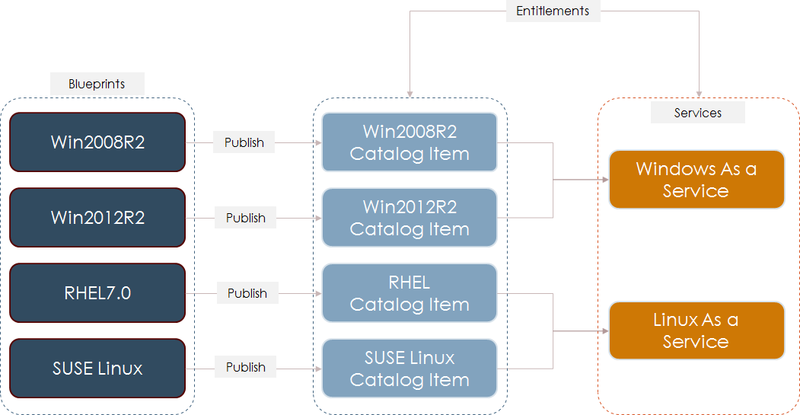 Assign entitlements to service, catalog items and Entitled actions to catalog items. Left hand side –Blueprints will be published and they become catalog items (the middle light blue). You then create service. Add catalog to the service. Finally you put the entitlements around Catalog items, Services and entitlements needed. Next post I will talk about naming conventions in vCAC. Reason we don’t see much on this yet, as it is evolving field. Not one person knows or have these skill sets. These components makes perfect orchestration layer but expects broad skill sets which are difficult to find. I’m mostly blogging on vCAC core stuff. But people expect a lot from vCAC Extensibility. It is skill which needs attention, understanding and has huge scope. 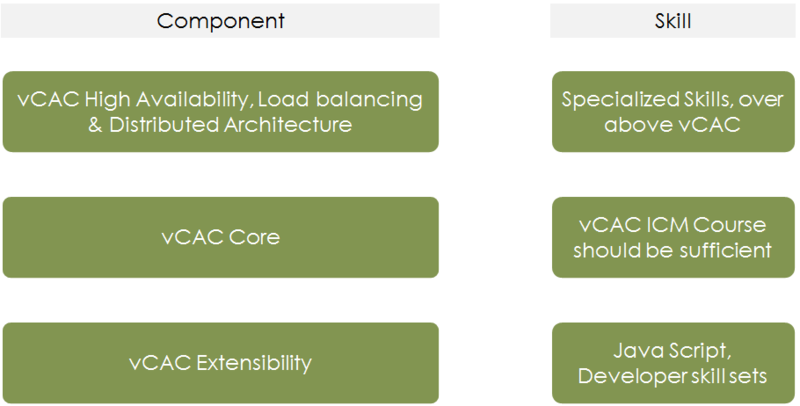 Below are frequently asked questions about various roles available in vCAC or I asked myself. This question helps me define Role Based Access control model for vCAC. Hope it also helps you too. Who has rights to create blueprint? Who has rights to create reservations? 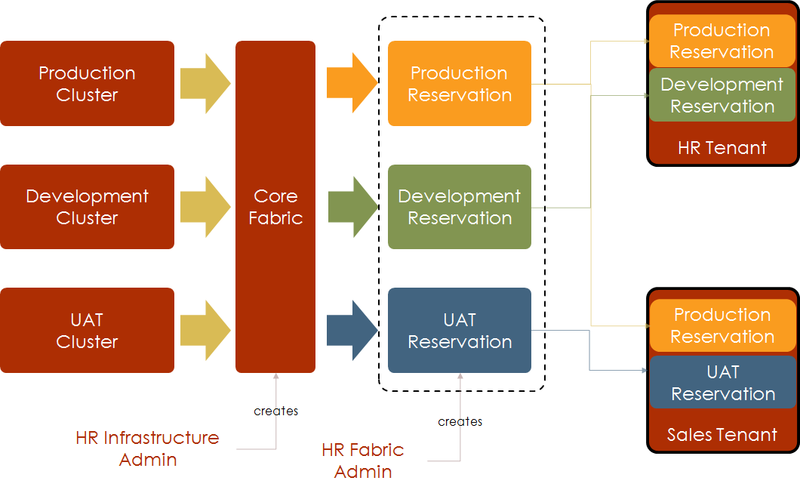 Fabric Administrator has rights to create reservation. Reservation can be shared between the tenant BUT only if the fabric is shared. Below is the example of shared fabric. I created a single fabric (i.e. mapped three different cluster to it) which will allow fabric administrator to choose from the cluster (i.e. compute resources) and assign them to tenants. In such model, reservations are visible across the tenants. It means Fabric administrator plays shared role in managing fabric. Who has rights to create prefix? 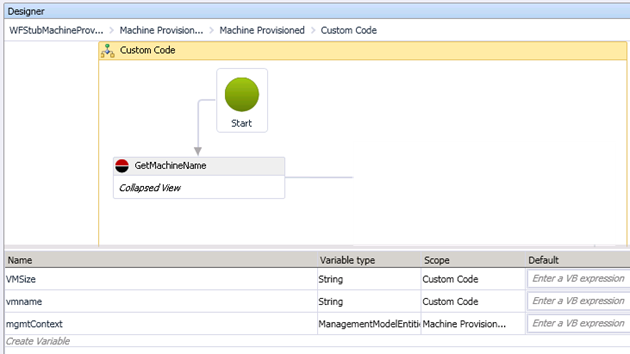 Machine prefix are created by Fabric Administrator, can be created by tenant administrator. Who has rights to create network profile? Who has rights to create business groups? Who has rights to create fabric group? Who has rights to create reservation policies? Who has rights to create & Published blueprints (a.k.a Catalog items)? Tenant Administrator can create and publish blueprints. Who has rights to create services? Who can creates approval policies? Before I start on the topic I wish to thank my readers. I’m blogging after more than four months, however I see my post is hitting consistently around 6000 hits per month. I’m surprised and pleased. Disclaimer: This blog and any blog posts do not represent my current organization in any form. Hope these are all genuine readers and getting most out of my blog. When I thought about this post, I asked myself why we need multiple tenants. What are the use cases for the multiple tenants. Before we dive into use case, let’s first understand few roles and what they can do (a.k.a privileges). When you first create tenant, you have to create two roles. Tenant Administrator and Infrastructure Administrator. At first thought I felt both these roles are unique to the tenant and responsible for managing tenants under which they are created. However it is not completely true. Tenant administrator controls tenant for which he is assigned but Infrastructure Administrator can control every other tenant’s infrastructure tab irrespective if he is infrastructure administrator for the tenant, all Infrastructure Administrators (of all tenants) can control infrastructure. 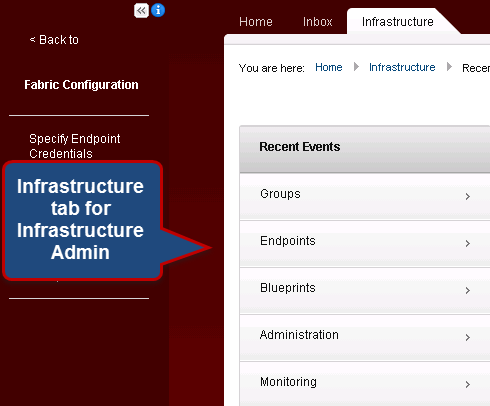 In simple words, infrastructure administrator of any tenant can modify anything inside infrastructure tab. However it is different discussing as to whether Infrastructure should do cross tenant administration. My first thoughts on this – Please do not mess with this one, however totally understand human errors behind this exposure. We make mistakes. Another role we create is fabric Administrator, Fabric administrator again see infrastructure Tab and same principle applies as for infrastructure administrator. It is worth to note, Infrastructure tab is coming from IIS Web server of vCAC infrastructure. 1. Reservations are visible across the tenants to all infrastructure administrators but you can do a little trick. Do no share fabric and it will give isolation at reservation level as well. 2. Machine Prefix – Machine prefix is visible across all the tenants to all infrastructure administrators. In below figure company-A fabric administrator can see company-B’s machine prefix and vice versa. 3. Manual Data collection requests option. This option is needed when you wish to update inventory of your vCenter into vCAC. Fabric Administrator and Infrastructure Administrator at both the ends can configure & control Tenants A & B and have full privileges across the tenants. 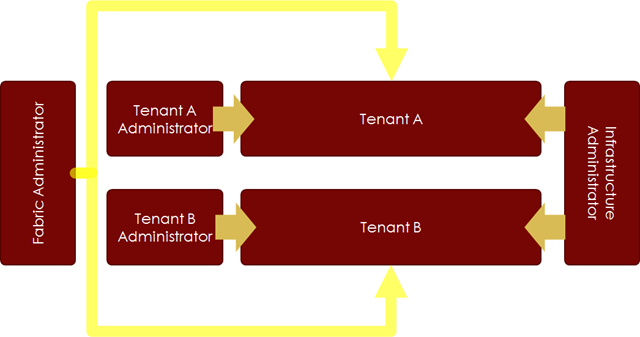 Tenant A and Tenant B Administrator controls individual tenant configurations. When you publish blueprint it become catalog. When you create service you add this catalog (published blueprint) to the service. Service can contain multiple catalog (published blueprints). Use firefox browser for better results with vCAC. 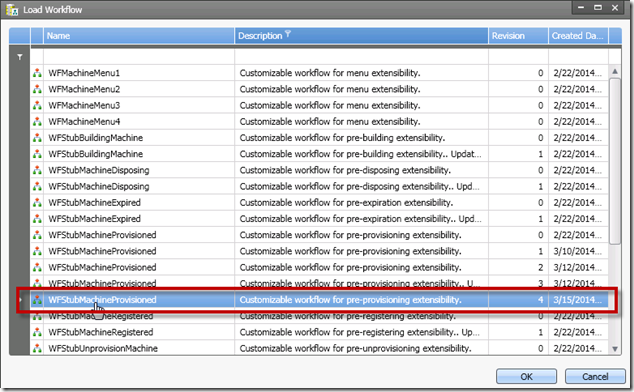 So you get true isolation/Multi-tenancy only at Blueprints, Services and catalog level. So answer to our main question is when we go for multiple tenants. When we do NOT want Catalogs , blueprints and services to be shared. In Machine Id field put a pre-defined variable “VirtualMachineId”. This is standard value. Please do not change it. Under machine name put the variable vmname. This variable we have defined above. 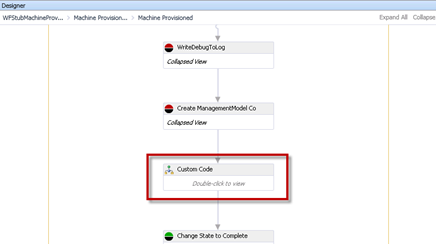 Machine Name will pickup name from virtualmachineid and pass it to vmname. Finally variable vmname will hold the name of the vm. We are done with GetMachineName. You will notice VMSize property name is in Quotes however Property Value is without quotes. 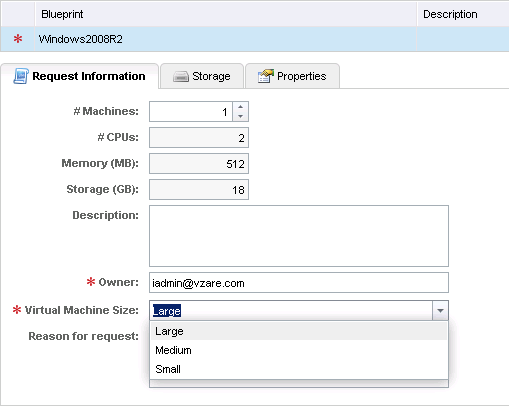 It is because VMSize in property value is variable which will be captured from user interaction in vCAC and VMSize in property name is coming from custom property defined in vCAC. 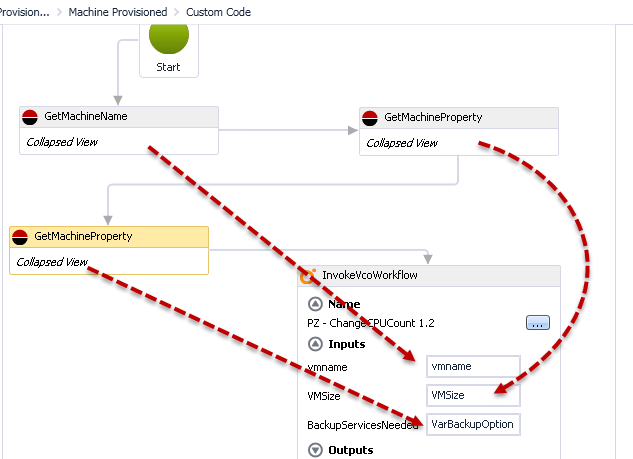 Simply put VMName and VMSize as input to VCO workflow. This is all you need to do. Request Virtual Machine and you will get what you have configured. 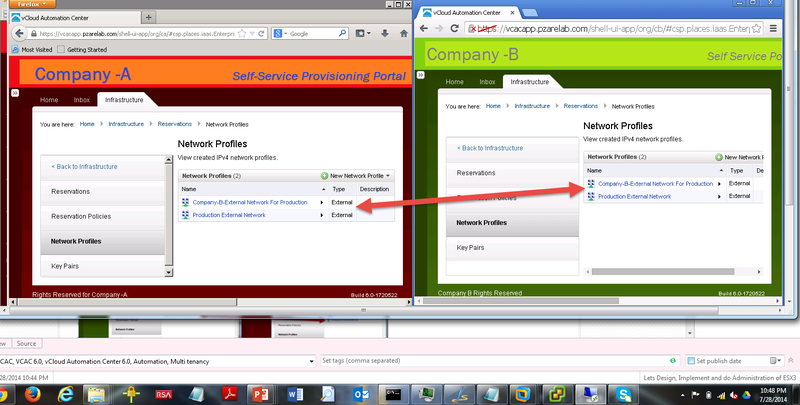 Complete log of VM provisioning via vCAC and VCO is presented below with sequence of action. Once done please click on green arrow. 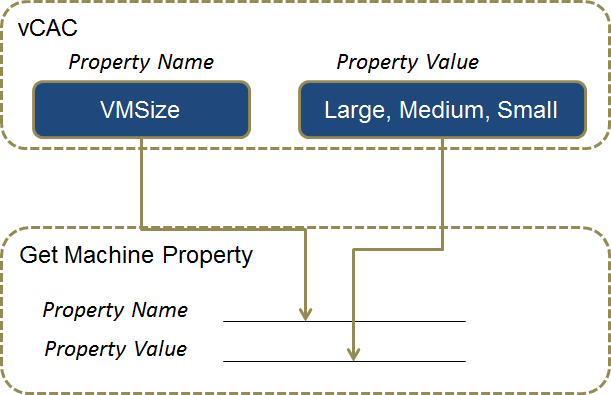 In the property attribute, select ValueList, Put same name “VM Sizes” and provide value as Large, Medium and Small which reflect the size of VM. 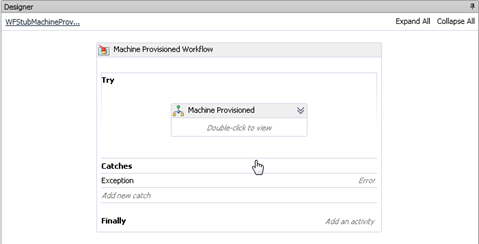 This post is about extending vCAC in-built workflows. 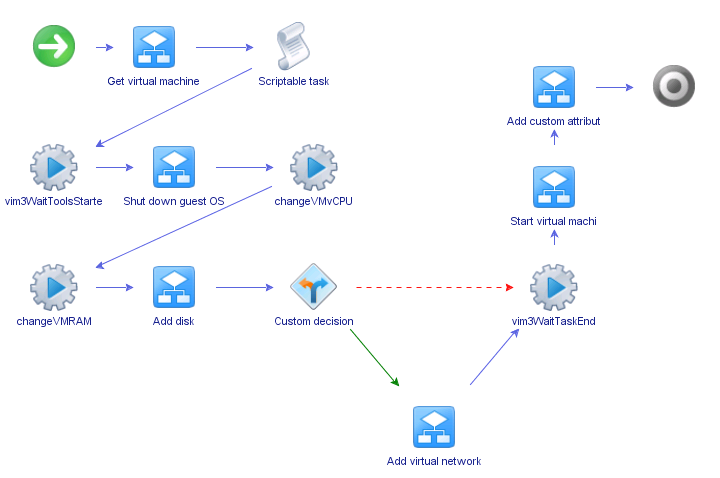 In last two post (Post1, Post2) I used vCenter Orchestrator (vCO) workflows and executed them using vCloud Automation Center’s (vCAC) advance service designer. 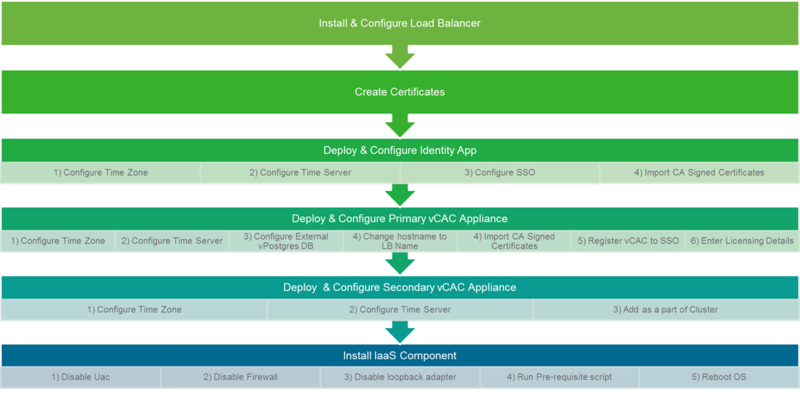 It was like taking vCAC as front end to execute those workflows without taking any benefits of vCloud Automation Center’s product. vCAC was purely acting as front end. Advance service designer doesn’t follow any reservation, policies configured for a particular tenant. 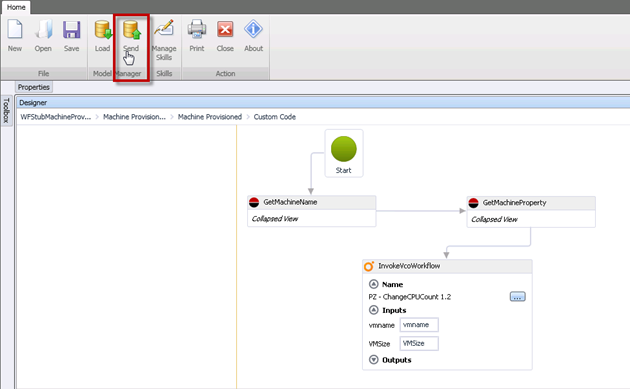 It is purely taking inputs from whatever is configured in vCenter Orchestrator workflow and executing it. As I think of it is of help but then I miss all configuration, tracking ownership, multi-tenancy and metering in built in vCAC. In order to cover this I need to do additional scripting which is referred as day-2 operation. 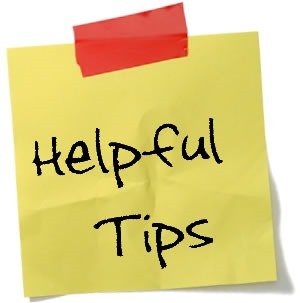 To cater this problem, vCAC provides you a way where you can modify in-built workflows. Basic details are provided into this document. I won’t repeat it here. But in order to understand this post you must read it. To extend workflow you need vCAC designer. It is part of vCAC and can be downloaded from https://vCACAppliance.hostname.com:5480/installer/. Install it. (it is next-next-next-Finish thing). 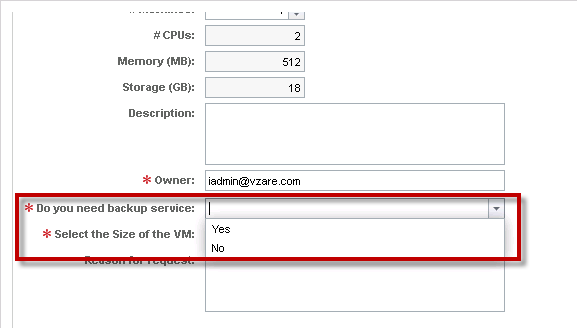 User should be able to provision VM by selecting VM size within vCAC interface. Users should be able to understand what compute, storage details are provisioned when they select VM Size. If you review this post, 3rd point is automatically taken care. So I have to just focus on how to take two input (VM Name and VM Size) from vCAC and put in the vCO workflow. It was bit simple, just two inputs. 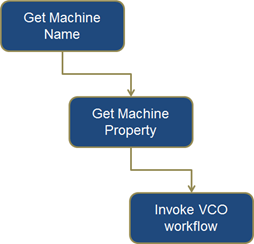 If you execute this workflow from vCO or vCenter VC:VirtualMachine as input is needed. 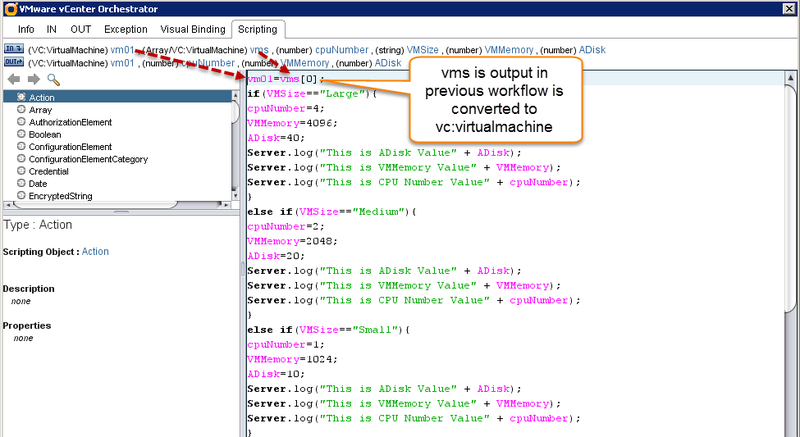 But vCAC do not understand VC:VirtualMachine, it can only understand string input or can provide string output. VC:VirtualMachine input is referred as complex object type. In order to deal with this input we need to put a wrapper around the workflow. 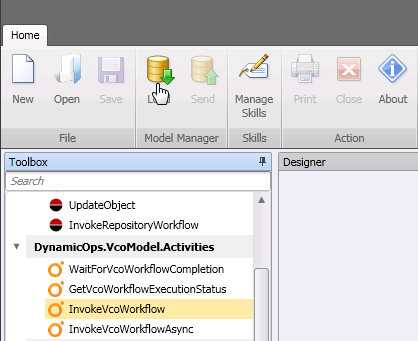 How to put a wrapper around a workflow is explained by VCOTEAM.INFO. Thanks to this post. It is key post. That post is a where you can start but that isn’t sufficient. You need more. If you refer below return type is array. When I executed the VCO workflow from vCAC, it failed twice. First it failed with VMware tools not working and second time it failed with error “Hot add functionality” is disabled in VM. First problem was when the provisioning activity was completed, my next workflow which was to shutdown the VM graceful was looking for VMware tools, it didn’t found vmware tools and abruptly failed. In order to shutdown VM gracefully VMware tools must be ready. So to address first problem I have to find a workflow which will check if VMware tools are ready. This can be easily checked by using “vim3WaitToolsStarted” action element. 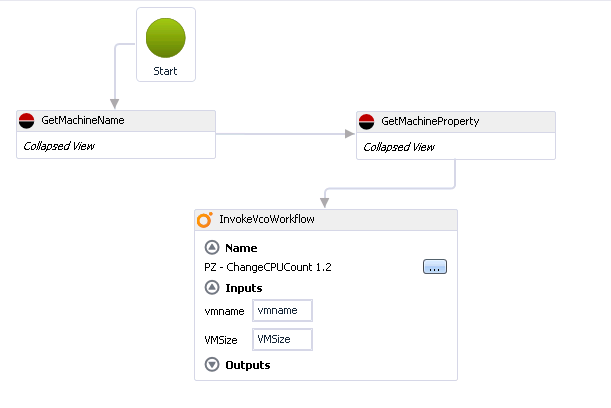 This workflow waits for VMware tools to be ready, as it is need to graceful shutdown VM. Second problem was workflow didn’t wait for another workflow to be completed. After I shutdown VMs I have workflow which will change CPU count, then change RAM, Add Disk and finally powered ON the VM. So powered ON workflow didn’t wait to execute CPU count, Add Disk and RAM change workflow. Therefore I use to get error about Hotplug not supported. It was like VM was started before even CPU and RAM change could be executed. So to solve this problem I added “vim3WaitTaskEnd” in-built workflow. This workflow checks previous tasks before executing next task.